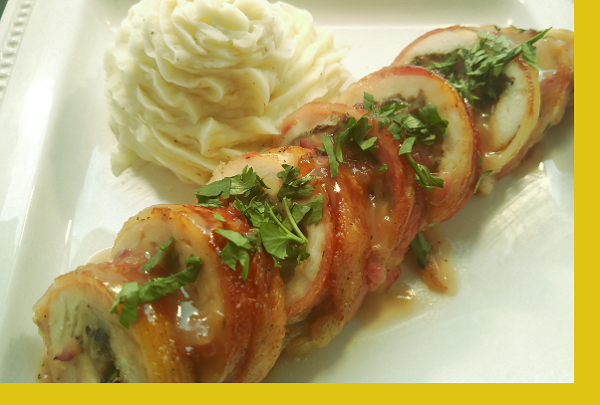 Chicken breasts filled with a mushroom, onion, parsley and swiss cheese stuffing that's then wrapped with bacon and served with an onion gravy deglazed with apple cider and maple syrup. Paired with mashed potatoes. Oven ready. All the hard works done so sit back then take all the credit. Voila! Dinner should always be this easy. Preheat oven to 350F. Place in oven uncovered. Bake for about 45 - 60 minutes or until internal temperature reaches 170. 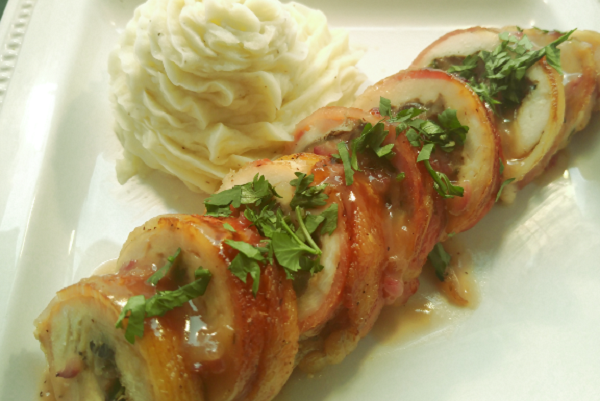 Serve with mashed potatoes and gravy. This was the best so far - totally amazing. Our kids loved it (although we had to remove the mushrooms from their chicken. This was my fav meal to date. The chicken is so good, you don't need the gravy. It is easy to prepare; I followed the instructions and it turned out perfectly. I think this is now my family's favorite! Great flavor. Of course the mashed potatoes are always delicious and we loved the sweet onion gravy.